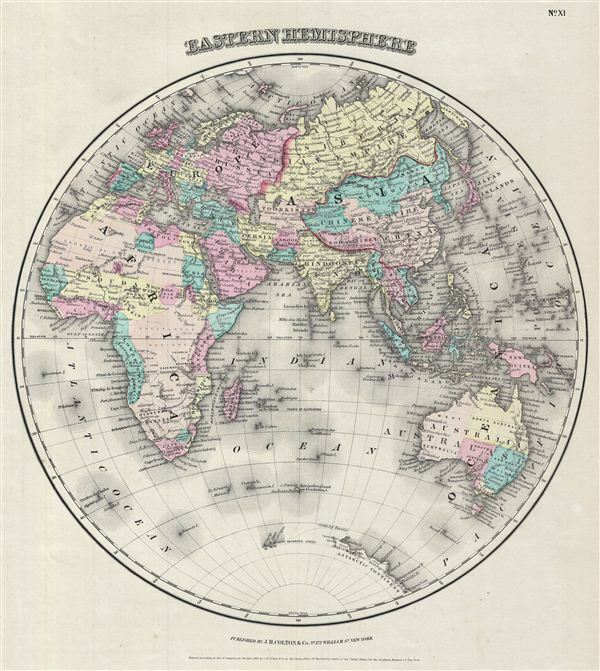 An excellent 1855 first edition example of Colton's map of the eastern Hemisphere. Offering a fascinating snapshot of the world during a period of rapid globalization and discovery, this map includes the entirety of Asia, europe and Africa as well as Australia and much of the Pacific. Much of central Africa is marked 'Unexplored Regions,' and both Lake Victoria and Lake Tanganyika have yet to appear. Similarly, the coasts of Australia are accurate but the interior is vague and unknown. The Antarctic continent is shown only embryonically, representing the relatively primitive state of Antarctic exploration in the mid-19th century. This map also identifies various cities, towns, rivers, rapids, mountain passes and an assortment of additional topographical details. Map is hand colored in pink, green, yellow and blue pastels to define national and regional boundaries. Surrounded by Colton's typical spiral motif border. Dated and copyrighted to J. H. Colton, 1855. Published from Colton's 172 William Street Office in New York City. Issued as page no. XI in volume 2 of Colton's 1856 Atlas of the World..
Rumsey 0149.008 (1856 edition). Phillips (Atlases) 816.